The AGM-65 Maverick was the first fire and forget weapon system to enter into service with the USAF. Image courtesy of Rama. The air-to-ground 65 Maverick is a tactical missile with kill rate of 93%. Image courtesy of Raytheon Company. An aircraft can carry as many as six Maverick missiles for conducting air to ground operations. The AGM-65B Maverick missile mounted on the wing pylon of A-10A Thunderbolt II aircraft. AGM-65 deployed on an A-10 aircraft. 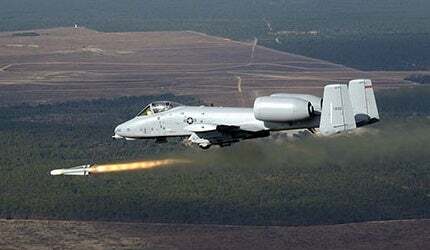 Firing of the AGM-65 Maverick from an A-10 aircraft. Image courtesy of Mr Z-man. The AGM-65 Maverick is a tactical, air-to-ground missile (AGM) in service with the US Air Force (USAF). It is a precision-guided weapon that can be used for defence suppression, close air support and interdiction missions. It has high strike probability and stand-off capabilities with a kill rate of 93%. The missile is used against multiple targets such as air defences, ships, heavy armour, fuel storage facilities and ground transportation equipment. It is manufactured by Raytheon Systems. The missile system is compatible for use with 25 jet fighter aircraft types, including F-16, A-10 and F-15E. Raytheon has produced about 69,000 units of the missile and has exported them to more than 33 countries worldwide. They include Australia, Japan, Malaysia, Israel, Belgium, Hungary, Canada, Greece, Jordan, Czech Republic, Italy, Oman, Chile, Brazil, Denmark, Iran, Iraq, Morocco, Indonesia, Egypt, Kuwait, the Netherlands, Switzerland, Poland, New Zealand, Portugal, Pakistan, Sweden, Spain, New Zealand, Saudi Arabia, South Korea, Serbia, Singapore, China, Thailand, the UK and Turkey. The missile played a crucial role in the Yom Kippur War, Vietnam War, Iran-Iraq and Persian Gulf Wars. Operation Desert Storm used about 5,000 AGM-65 missiles of different variants to attack the armoured targets of the Iraqi military. Maverick is also in service with the US Navy and the US Marine Corps (USMC). "Hughes Missile Systems (now called Raytheon Systems) won a $95m contract from the USAF to produce 17,000 AGM-65 missiles in 1968, following a pitch against Rockwell." Development of the Maverick began in 1966 and took six years for completion. The missile was designed to replace the ageing radio-guided AGM-12 Bullpup missiles which were initially launched in 1959. The Maverick AGM-65 was first deployed by the USAF in August 1972, replacing the AGM-62 Walleye in the 1970s. Hughes Missile Systems (now called Raytheon Systems) won a $95m contract from the USAF to produce 17,000 AGM-65 missiles in 1968, following a pitch against Rockwell. The AGM-65 A variant was developed with an electro-optical television guidance system and successfully tested by 1969. The first Maverick A missile was delivered to the USAF in 1972. An improved version, AGM-65B, was subsequently developed, with the USAF acquiring about 25,750 of the A and B variants of the Maverick. The A version has subsequently been put out of service with the US. The AGM-65D was developed with imaging infrared (IIR) seeker and was delivered to the USAF in October 1983. The AGM-65G became operational in 1989 with an IIR seeker, shaped warhead and modifications to the software of D variant. AGM-65F, the US Navy variant, was developed in 1989 by combining the IIR, warhead and propulsion systems of D and E variants. Rockwell developed the AGM-65C/E with laser-guided seeker for the USMC in 1978 and the Maverick H and K models are the most modern missiles. The AGM-65H was developed with charge-coupled device (CCD) seeker on the Maverick B/D missiles. AGM-65K is the modernised version of the Maverick G with CCD. Raytheon is currently producing the K and H variations. The AGM-65L, a USAF variant with digital semi-active laser (dSAL) seeker, is currently under development under a $34.4m contract with Raytheon. A-Darter, also known as V3E Agile Darter, is a fifth-generation short range, air-to-air missile (SRAAM) developed in South Africa. The AGM-65’s configuration is similar to that of AIM-54 Phoenix and AIM-4 Falcon missiles. The missile has a modular design, which allows it to be equipped with different guidance packages and warheads. The missile is about 2.49m long with 0.3m diameter and a wingspan of 0.72m. It has a cylindrical body with the warhead at its central section. Additionally, it has delta wings with a long-chord. Tail control surfaces are mounted close to the trailing edge of the aircraft’s wing. An aircraft can carry up to six Mavericks at a time and the missile can be assigned to multiple targets simultaneously. The missile is normally fitted to the under wing clusters of a aircraft. The AGM-65 uses solid fuel for propulsion. The power plant consists of Thiokol TX-481 solid-propellant rocket motor situated behind the warhead. The missile fires at a speed of 1,150km/h and has a range of about 22km at medium altitude. The Maverick can carry two types of warheads – including a heavy weight warhead that penetrates the target before detonating, with the help of a delayed fuse; and a shaped charge warhead consisting of a contact fuse in the nose. The heavy-weight warhead is more efficient against harder and larger targets. "The pilot or weapon systems officer (WSO) has to lock the target manually before the missile is fired." The AGM-65B/D/H missiles carry 56.25kg of cone shaped warhead and the AGM-65E/F/G/K models are equipped with delayed fuse penetrator heavyweight warheads. The pilot or weapon systems officer (WSO) has to lock the target manually before the missile is fired. The Maverick is a fire and forget weapon which autonomously tracks the path to the target automatically. The Maverick has three different seekers that vary with the mission variant. The AGM-65B/H/K variants use electro-optical (EO) television imaging guidance system, while the AGM-65D/F/G variants use imaging infra-red imaging and the AGM-65E is equipped with a laser-guided system. The main subcontractors and suppliers of Raytheon for the Maverick’s production include Analog Modules, BAE Systems, Kaman Aerospace, Alliant Tech Systems, EaglePicher Technologies, ELCAN Optical Technologies, Primus Technologies, Woven Electronics, Ensign Bickford, MOOG, and Reynolds Systems.